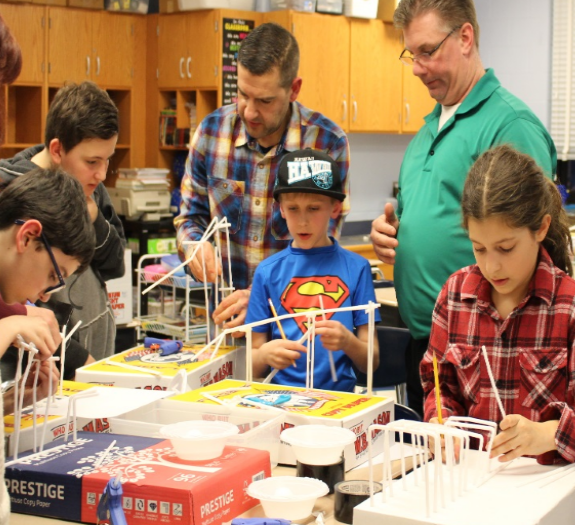 Approximately 100 fifth grade students in the Laddie A. Decker Sound Beach School and their families recently came together during the first Science, Technology, Engineering, Art and Math exploration night. This event was part of a District initiative to expose students to a wide variety of scientific concepts and help them develop a love of learning. Prior to the event, Mr. Bassan, a LADSBS parent and Brookhaven National Lab engineer, enhanced the evening by showing students how to build circuits to power LEDs and LED toys. Following the presentation, students explored building the circuits themselves. Students also visited two classrooms of their choosing, exploring science and engineering-themed stations to learn the mathematical framework behind physics and civil engineering concepts. 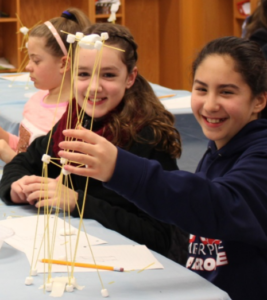 In addition to learning the theory, students were able to put their new knowledge to practice building catapults, aluminum foil boats, paper airplanes, straw roller coasters, marshmallow towers, balloon racecars, computer programs, egg-drop devices and more. The night was further enhanced by the helpful hands of the North Country Road Middle School National Junior Honor Society volunteers, who assisted the teachers in each of the classrooms. This night had the parents and students alike asking for more!